We visited Tuscany at the end of summer and were surrounded by grapevines everywhere we went, with the gorgeous, plump purple grapes ready to harvest at any moment. I loved the vibrant vines in the foreground framing the rolling hills dotted with more grapevines, olive trees, and plowed grain fields in the distance. 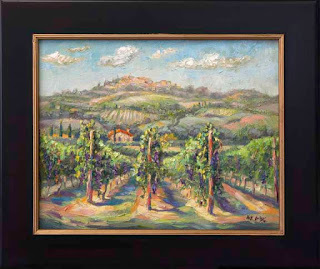 Setting up my easel across from this vineyard, I created this textured oil painting with palette knife and a lot of paint. I arranged the planted vines to lead your eye back to the Tuscan villa and then to the hill town perched above the valley. Morning light cast deep purple shadows on the ground and caused the leaves and soil to glow. As a treat when I finished, we enjoyed a picnic of salami, proscuitto, pecorino and of course, vino. Yum!